It’s hard to believe the holiday season is in full swing (especially sat here on the beach in sunny Barcelona), but it is. If you’re not sure what to make for Thanksgiving next week, don’t worry, I’ve got you covered. Here’s a round-up of holiday recipes – from interesting variations on classics like cranberry sauce, to new interpretations of the centerpiece of the table. 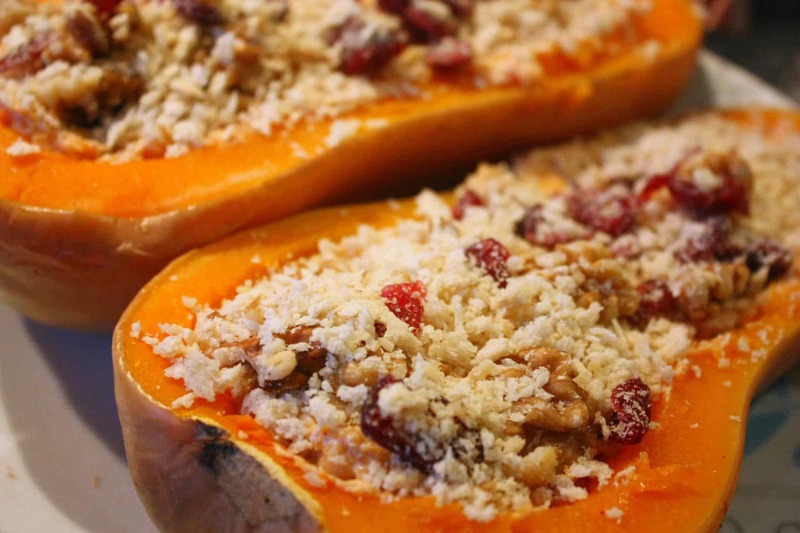 Do something different this year and ditch the turkey (obvs) and the Tofurkey. Who says that you need a meat substitute at the heart of your table? 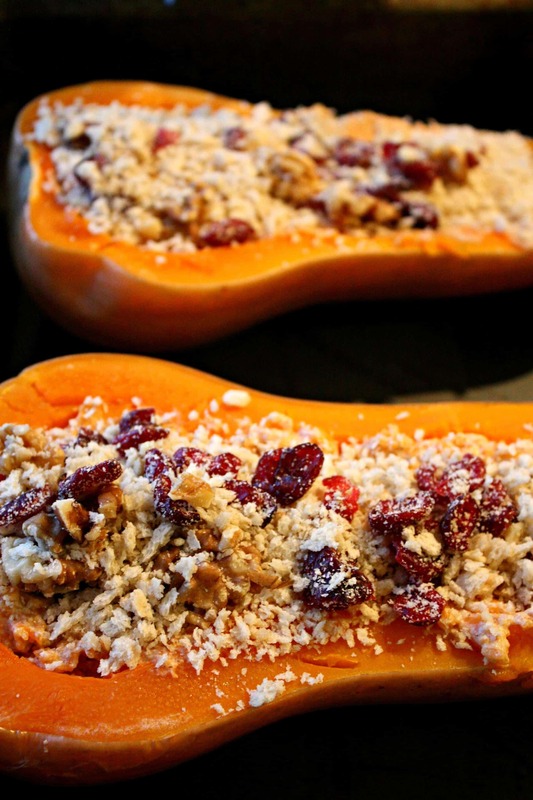 My recipe for twice-baked butternut squash was just featured in The New York Times! Incorporating classic fall flavours like cranberries and squash, these also look fantastic as a centerpiece of your table. 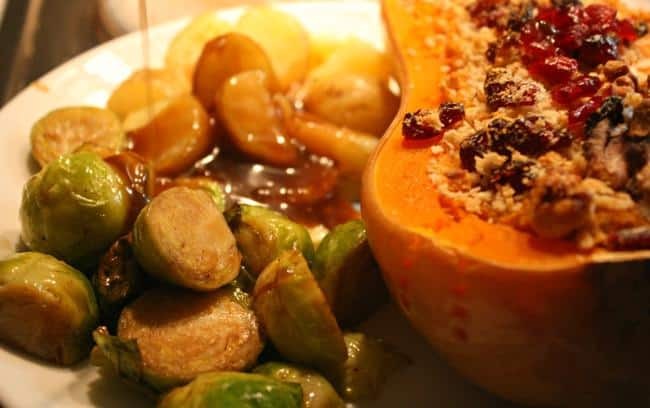 Whilst I originally developed this recipe for a Christmas dinner, it would be perfect for Thanksgiving too. Ravioli might not be a traditional Thanksgiving food, but these pumpkin-cashew cheese ravioli in sage-butter sauce are pretty enough – and autumnal enough, with their pumpkin filling – to be right at home on a Thanksgiving table. Plus everyone will be impressed with your homemade pasta-making skills! 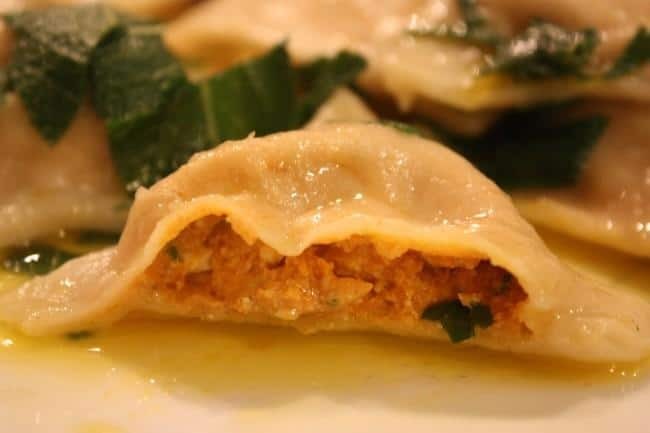 If you’re not a fan of pumpkin in ravioli, try these spinach and cashew ricotta ravioli. I recently made this traditional Maltese dish, called timpana, for a dinner party. It’s hearty and delicious, and if you’re not afraid of a little holiday carb-on-carb action, I highly recommend it. Recipe on Mouthwatering Vegan. If you want to go the “traditional” vegetarian route of meatless loaf, this meatless loaf made with sweet potato, white beans, carrots and plenty of herbs and spices looks delicious. Recipe on Fatfree Vegan Kitchen. 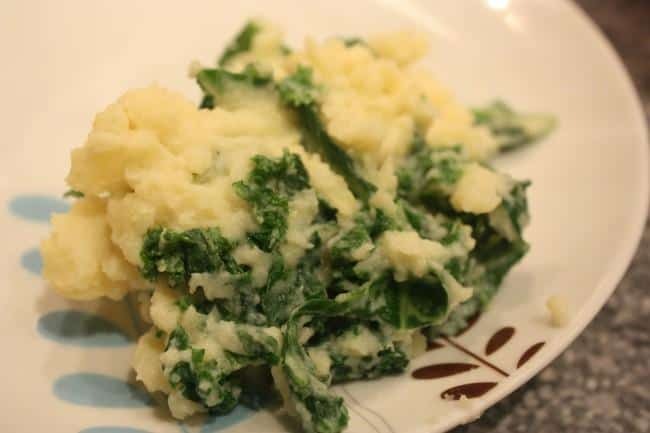 This traditional Irish take on mashed potatoes, colcannon, comes with the addition of greens (I use kale) so you can feel at least a little bit healthy this holiday season. I don’t believe a holiday table is complete without Brussels sprouts, and whilst looking for Brussels sprouts recipes I came across this really interesting take on Brussels sprouts with a spicy coconut-ginger sauce. They look delicious! Recipe on Cookie and Kate. I’m not even a fan of mushrooms, but these red-wine infused mushrooms sound and look so good. But then again, they’re infused with wine, so how could they not be?! Recipe on Cadry’s Kitchen. The other day I was thinking about cranberry sauce (as you do) and began to wonder why people don’t add amaretto to it. One of my friends and I “discovered” the deliciousness that is amaretto in cranberry juice some years ago (try it! ), and I figured it would make a great addition to cranberry sauce. A quick Google search and I discovered that someone has, in fact, done this, and in an additional stroke of genius, added orange juice and zest to the mixture. I’ve “tasted” it in my mind and it is a really good combination. Recipe on Farm Girl Gabs. Another one with amaretto. At my last dinner party, this ice cream got me a marriage proposal and another friend declared it the best ice cream she’d ever had. 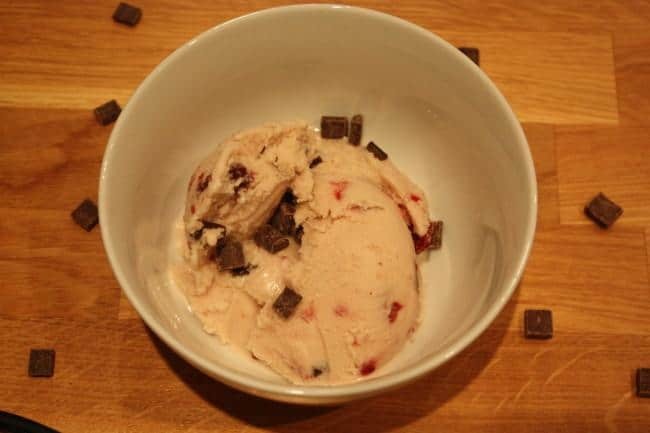 Amaretto, cherry & chocolate chunk ice cream. Okay, Thanksgiving wouldn’t be Thanksgiving without a pumpkin pie, would it? For a traditional version, I’ve had luck with the filling from Oh She Glows (which uses canned coconut cream – which sounds weird but doesn’t come across coconutty and everyone who’s tried it said it tasted like non-vegan pumpkin pie). For the crust, I use a recipe adapted from Voluptuous Vegan. The key to this recipe is making sure the chilled ingredients (flour, canola oil) are very cold, as cold as possible. Put them in the fridge for a few hours or the night before to chill. Toss the flours, baking powder, sugar, and salt together in a bowl. Drizzle in the oil a little at a time, tossing lightly with your fingers or a wooden spoon (I always use fingers). The flour should lump in different size pebbles, from very small to ½ inch lumps. Add the cider vinegar to the ice water. Drizzle this mixture a little at a time into the dough, tossing in the same way as with the oil. There is enough water when the dough starts to hold together when pinched. Do not add too much water, but just enough to hold the dough together when you squeeze it. You may not need all the water. Separate the dough into two balls. Wrap the balls in plastic. If you want a non-traditional take on pumpkin pie, these pumpkin pie truffles look delicious. Recipe on Connoisseurus Veg. Do you have any other Thanksgiving favourites? What are your top holiday recipes? And what are you planning to make?